For years, the only approach to protecting concrete floors was to cover them with a film or membrane. Such products include acrylics, urethanes, epoxies and waxes. By their very nature, however, coatings are only a temporary solution. They are subject to delamination, scratching, chipping and wear. Eventually, they have to be replaced. This involves the expense of downtime, materials and labor. Some inexpensive coatings last only as little as 6 months to a year, so the associated maintenance costs are frequent and high. 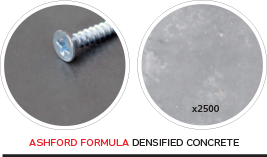 The Ashford Formula takes a different approach to concrete floor protection. Rather than coating the surface with organic solids, the Ashford Formula grows new crystals in the concrete. This reaction fills in the natural pores and voids in the concrete and provides a dense, hard surface that is easy to clean. 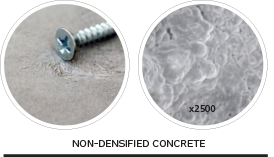 The concrete is densified internally and inorganically. There is nothing to wear off the surface, nor is there anything to replace. The same reaction also makes the surface much harder and resistant to abrasion. In addition, the floor surface is rendered free of dust. The idea of achieving these results was initiated nearly 70 years ago by the Ashford Formula. This is the product that created an entirely new industry. Because of the success of the Ashford Formula, many imitations have come on the market. None of them, however, can match the long-term performance of the original. No one has the same unique catalytic chemistry that has delivered results lasting almost 70 years. No one has the same Lifetime or 20-year warranty that is validated by nearly seven decades of proven performance.